Alec Baldwin had a twitter meltdown over an accusation that his wife Hilaria was tweeting during James Gandolfini's funeral, and I have a lot of sympathy for him. What appears to have happened is that Hilaria has her Twitter location set to PDT, ie the time zone for California, which is 3 hours behind New York (EDT) where James Gandolfini's funeral was held at the Cathedral of Saint John the Divine at 10:00 am EDT. The Tweets highlighted by the Daily Mail [here, and here] appear to have been posted at 10:17 and 11:09 respectively, but this is definitely not EDT. At the time of writing it is 23 hours since the funeral, meaning the tweets were posted three to four hours after the funeral started; ie at 13:17 and 14:09 EDT. As Alec Baldwin points out, his wife is heavily pregnant, so they didn't stay too long after the funeral. 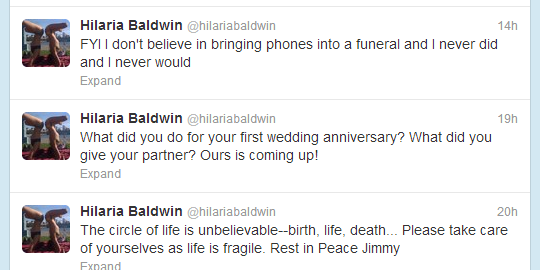 Since it's almost certain from the timestamps she wasn't tweeting at the funeral and I've seen nothing Hilaria is alleged to have tweeted that is anywhere near out of order for 3-4 hours after a funeral I'd say Alec Baldwin can be forgiven for being very cross indeed.